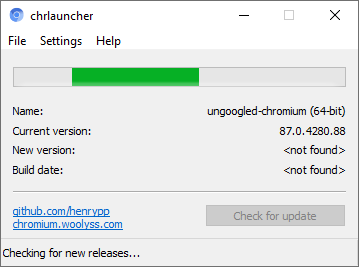 chrlauncher has feature to use portable Chromium as default browser and it will be open links from another programs through chrlauncher. start "Control panel" -> "Default programs" -> "Set your default programs" -> "chrlauncher" and set all checkboxes on. There is list of arguments overrides .ini options. /autodownload - auto download update and install it! Chromium and their clones (like Google Chrome, Yandex Browser and other legitimate trojans!). chrlauncher has feature for use portable Flash Player PPAPI. Unpack archive to the "Plugins" folder. Open "chrlauncher.ini" and find "FlashPlayerPath" option and then set ".\Plugins\%flash_player_dll_name_here%"
# Relative (to chrlauncher directory) or full path (env. variables supported). # true	-> auto download update and install it! # dev-official		-> Official development builds from snapshots repository "commondatastorage.googleapis.com/chromium-browser-snapshots/index.html"
# dev-clang-nosync	-> Unofficial development builds without Google services "github.com/henrypp/chromium/releases"
# stable-codecs-sync	-> Unofficial stable builds with codecs "github.com/henrypp/chromium/releases"
# ungoogled-chromium	-> Unofficial builds without google integration and enhanced privacy "github.com/Eloston/ungoogled-chromium"
# dev-codecs-nosync	-> !!! DISCONTINUED since June 2018 !!! # stable-codecs-nosync	-> !!! DISCONTINUED since June 2018 !!! # dev-codecs-nosync-experimental -> !!! EXPERIMENTAL !!! # Unofficial development builds with codecs and without Google services "github.com/macchrome/winchrome/releases"
How to force check for an update every chrlauncher start? Host the Chromium package zip on custom network? To activate portable mode, create chrlauncher.ini in application folder, or move it from %APPDATA%\Henry++\chrlauncher. Binaries have GPG signature chrlauncher.sig in application folder. Put chrlauncher.lng file into application directory and restart the program.